Send your order by MAIL or FAX at our CHECKOUT. Wear your military dog tags while hunting, fishing, camping, and for all your outdoor and survival needs. Easy to carry identification for children, runners or joggers, bikers, skaters and hikers. Stylish, waterproof, dirt proof, and can be worn any time by everyone. The same high quality stainless steel components used by the military army. Will not stain or discolor your skin with extended wear, like aluminum, tin, or brass. You can have custom text on each dog tag at no extra charge. Order extra beaded chains and dogtag silencers on our SUPPLIES and ACCESSORIES page. Trendy and Stylish, Alert Medic Tag even teens will wear! Personalized alert tags can relay key medical conditions, medications, or allergies, even when you can not. Order "COOL" medical tags for kids and teens. These fashionable Army Medical Identity Tags are very popular with students on campus. Ideal replacements for lost or missing medic & alert tags. Customize your medic advisory tags with any personal information. A small price to pay for GREAT peace of mind!!! Lightweight PET TAGS that are durable, waterproof, and wear resistant. Ideal for heavy duty outdoor applications, breeder and veterinary uses. Your Pet's Medical ID Tag can identify special needs or conditions. Unusual pet id tags that will not discolor the coat of light colored pets. Rubber silencers cover the pet tag to prevent rattling are available in many fashionable colors. Customize your Service Dog ID Tag with all your vital information. Remember, you can have custom text on each tag at no extra charge, to reduce the cost per person. Personalized gift ideas for Birthdays, Anniversaries, Family Reunions. Friendship Tags for Boy Scouts, Girl Scouts, summer camps, and church retreats. Grab bag gifts for Company Picnics, or Class Reunions. Smart, eye-catching party favor for your next big event. Souvenir dog tags for a Golf Tournament, Competition, or League Play-off. School Spirit and Team Mementos. Color code the silencer by team, class, or section. Customized army dogtags with fancy motivational quotes, inspirational phrases, bible verses. Up to 80 characters of your choice. Fundraisers for Churches, Clubs and Groups. 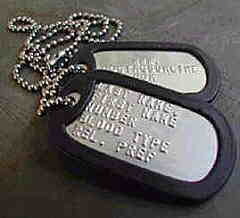 Personal dogtags are top selling items at many charitable events. See BULK ORDERS for our online wholesale quoting form. Profit With No Money Up Front On Your Next Fundraiser! Orders are generally filled within 24 hours of receipt of payment. Discounts for Promotional, Marketing, and Special Events. Give LASER ENGRAVED DOG TAGS for Advertising and Sales Promotions. These dog identity tags can be engraved with any combination of logos, pictures, and text supplied by you. Personalized KEY TAGS with your unique identification. Durable Briefcase ID and LUGGAGE TAGS, for all your travel needs. 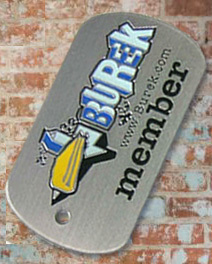 Heavy Duty Name Tag for Sports and Golf Bags, that are original and very stylish. Permanent identification for Tools and Equipment.